If your computer has a compatible PCIe-based M.2 slot, and you aren't currently using it, you are making a big mistake. Why? Because NVMe solid state drives are insanely fast -- putting SATA variants to shame. If your desktop doesn't have an M.2 slot, don't worry -- you may be able to add one using a PCIe adapter card. Unfortunately, NVMe drives can be expensive comparatively. Thankfully, they are dropping in price all the time. 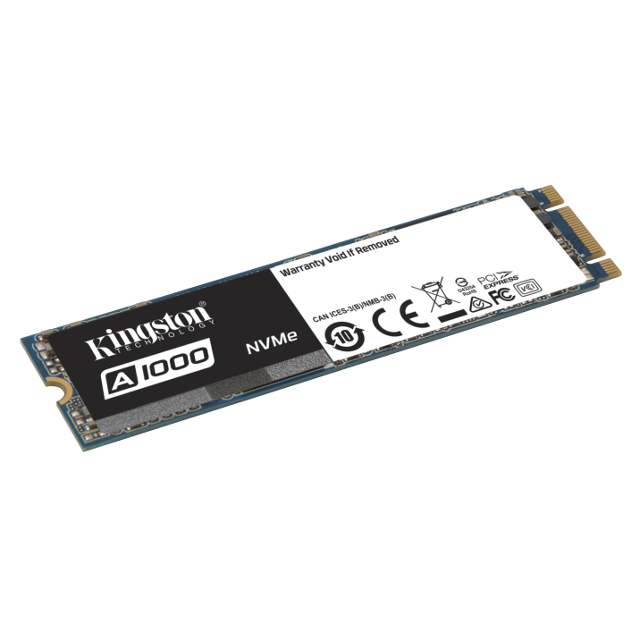 For example, today, Kingston launches an all-new affordable such drive called the "A1000" and it looks quite nice. Unfortunately, it leverages PCIe NVMe Gen 3.0 x2 rather than x4, so it is slower than offerings from some of its competitors. With that said, it is still significantly faster than SATA. "The single-sided M.2 2280 (22mm x 80mm) form factor makes A1000 ideal for notebooks and systems with limited space. The PCIe NVMe drive features a Gen 3.0 x2 interface, 4-channel Phison 5008 controller, and 3D NAND Flash. It delivers 2x the performance of SATA SSDs with read/write speeds up to 1500MB/s and 1000MB/s giving it exceptional responsiveness and ultra-low latency," says Kingston. Ariel Perez, SSD business manager, Kingston explains, "Designed with 3D NAND Flash memory, A1000 is more reliable and durable than a hard drive, and doubles the performance of a SATA SSD. Now we can give consumers the benefit of PCIe performance at about the same price as SATA. Consumers can replace a hard drive or slower SSD with A1000 and have the storage needed for applications, videos, photos and more." Kingston shares the following specifications. So, how much does the drive cost? Obviously, it will vary based on capacity. Kingston is selling the 240GB model for $119.60, the 480GB for $218.40, and the 960GB for $403. You can get it from the company directly here. While those prices are competitive and affordable, they aren't far off from the excellent (and much-faster) Samsung 960 EVO. With that said, Kingston is hardly an unproven company -- the A1000 should be solid. Ultimately, more choice for consumers is a good thing.